In a large bowl whisk together half and half, sweetened condensed milk, 1 teaspoon vanilla, eggs, and salt until combined. Place liquid in a wide re-sealable container and press slices of bread inside the container until they absorb some liquid. Place in the refrigerator for 20 minute, turning over bread half way through. In a large skillet, over medium low heat, melt 2 tablespoons of the butter until it foams. Add the brown sugar and stir for 30 seconds. Add the peaches; raise heat to medium high, and cook, stirring frequently, for 3 minutes. Transfer to a bowl and reserve. Prepare the topping by placing the heavy cream, sugar, and remaining teaspoon of vanilla in a stand mixer. Using the whisk attachment, whisk together until stiff peaks are formed. Refrigerate whipped cream until ready to serve. Add a few pads of butter to a non-stick griddle on medium low heat. Once melted cook the slices of toast for 3 to 4 minutes on each side, until golden brown. 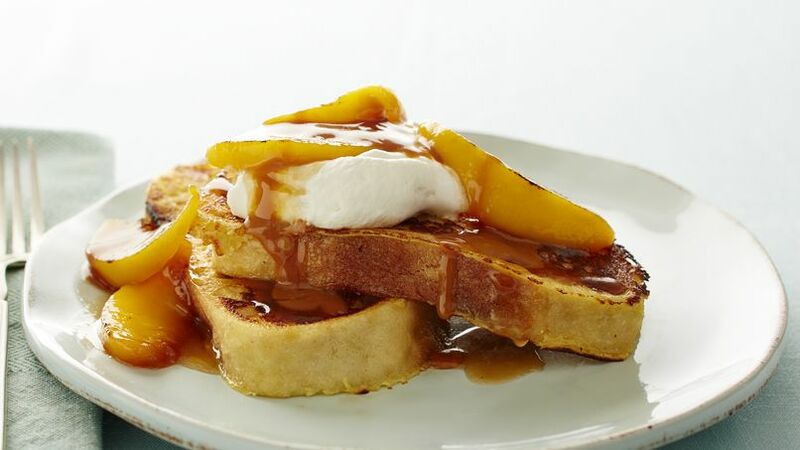 Plate two French toasts and add on the top of the toasts some of the peaches mixture and a spoonful of whipped cream. Drizzle with dulce de leche. Serve immediately as the topping will melt quickly.